Many Iowans are making resolutions to exercise more in 2019 and an Iowan who recently won the U.S.A. Marathon Championship has some advice for those who plan to make running part of their health improvement plans. Austin, a Boone native who now lives in West Des Moines, won the national marathon championship in Sacramento, California on December 2. He finished the 26.2-mile race in 2 hours, 12 minutes 38 seconds. In order to make the U.S. Olympic marathon team, Austin would need to finish in the top 3 in the Olympic Trials race scheduled for February 29, 2020 in Atlanta. 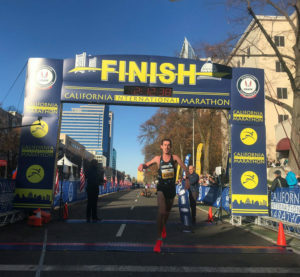 Austin told Radio Iowa he felt like he had the potential to win the race in California, but was somewhat shocked with his performance over the last three miles – when he overtook the runners who were in third and second – and then closed on the leader. Austin believes the secret to his strength at the end of race stems from his unique training program.